Fred Rodgers is often quoted saying what I believe a fundamental perspective in creating healthy and resilient children. He says, “play is often talked about as if it were a relief from serious learning. But for children play is serious learning. Play is really the work of childhood.” It is through play experiences that children learn and practice all the essential skills that will set them up for success later in life. They learn to empathize with their peers, to problem solve, to express their creativity, to socialize, to express themselves, etc. Many of the skills we use as adults today to create relationships, to advance careers, and to be great parents were all learned through our play experiences as children. However, not all play is created equal. “Playful learning is an umbrella term that includes both free play, which is totally child-directed, and guided play, in which adults scaffold children’s interests and learning.”(Roberta Golinkof). Roberta Golinkof’s research shows us that guided play advances cognitive skills like language and reading, as well as social skills like emotion regulation. Even with evidence like that of Golinkof’s and various other play researchers, we have seen a drastic drop in playtime for children. This is due to the idea referenced above by Fred Rogders, that letting children play will take away from their more ‘serious learning’ and other academic pursuits. I’ve already shown that play is actual real learning, but play also creates better learners! Several studies say that children are more focused and ready to learn after they’ve had recess, an opportunity for free play without adult intervention (see Pellegrini and Holmes 2006). Physical activity is undoubtedly beneficial to increasing the ability to learn. Studies conducted by Dr. Chuck Hillman show that after 20 mins of walking, your brain is more primed for learning. 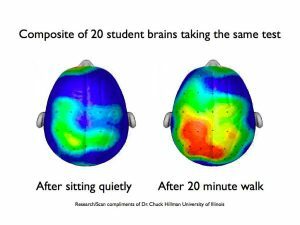 This image shows the results of brain activity of students after walking for 20 mins vs after sitting quietly. While physical activity is undoubtedly importance to improve learning and cognitive function. Other studies show that the combination of free play and physical activity is the key! This means that structured activity does not deliver the same benefits as free play combined with physical activity.